Uzenzele provides access to development finance for growth, expansion and exit opportunities for established and profitable businesses in 6 African territories, allowing international players to partner with strong local partners in their pursuit to participate in the growth on the African continent. Entrepreneurs in Africa have built established, profitable businesses over decades and sometimes even over generations. These, usually family-style, businesses are planning their next growth path and are looking for financial and technical skill to go to the next phase. 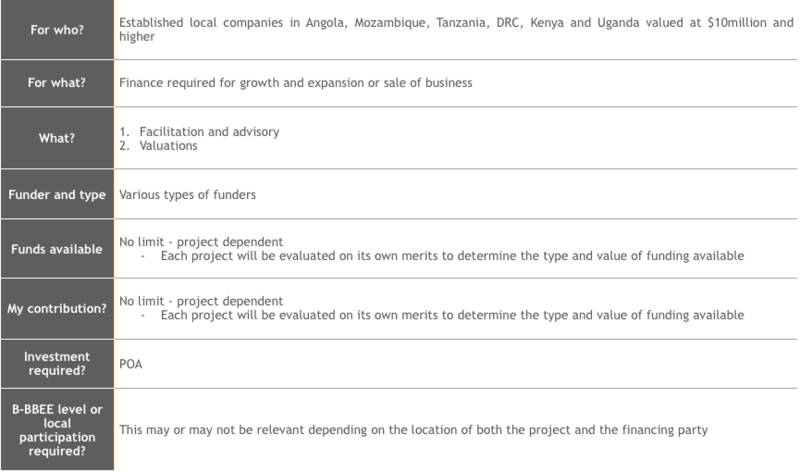 We match these businesses with relevant international funders and/or buyers through our networks.